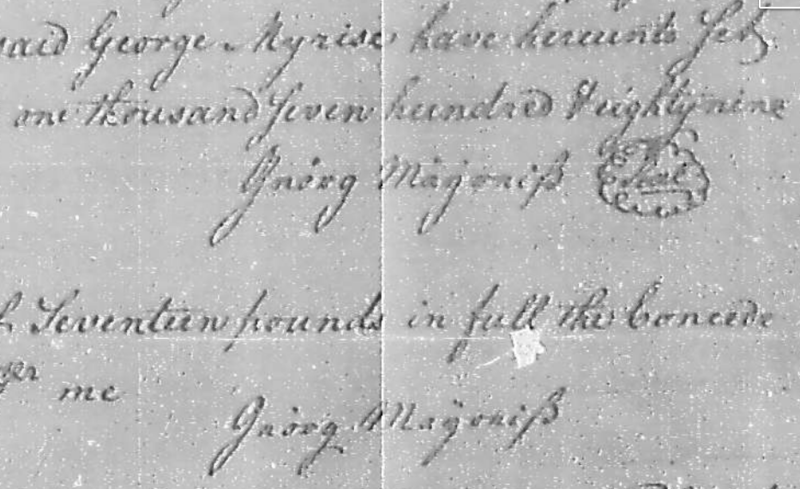 With many thanks to the staff at the York County (PA) Archives, I was able to quickly receive 2 deeds that mention my George Myrise, via email, with excellent scans! So, I hope you’ll excuse my absence for the last week, as I’ve been pouring over all of these documents! So, here we go. The following document is from the Deed books at York County, and is dated 22 October 1785, between a Mathias Baker, and his wife Mary, and our George Myrise. Note – reading legal papers is not easy, I’ve done my best. After the Days & Times the sum ought to be paid and discharged that then it shall and may be Lawfull to and for the said Mathias Baker his Heirs or Assigns, into or upon the said Lots of Ground or any part thereof to enter and distrain for the said Ground Rents and the distress or distresses then and there so found to take lead drive carry away and Impound and Impounded to detain at the risque Con [?] and Charges of the said George Myrise his Heirs or Assigns for the Space of ten Days and if within the Space of Ten days satisfaction and payment be not made of the Groundrents and Averages thereof if and such be the said distress or distresses to Expose to Sale at public Vendue for the best price that can be reasonable gotten for the same and after Payment of the said Groundrents and averages thereof if any be with costs of distress detainure and and Sale the over plush if any be to be returned to the said George Myrise his Heirs and assigns. Provided also if no distress can be found sufficient to satisfy the said Groundrents and averages thereof upon the said Lots of Ground and Promises that then it shall and may be lawfull to and for the said Mathias Baker his Heirs and Assigns into and upon the said Lots of Ground or any part thereof in the Name of the whole wholly to ReEnter and the same again to Repossess and Enjoy as his or their own Estate and Property in as full and absolute a Manner to all Intents and Purposes as if the Indenture had never been Executed. And the said George Myrise doth for himself his Heirs & Assigns Covenant & Promise to and the said Mathias Baker his Heirs & Assigns in Form following that the said George Myrise his Heirs Executors Administrators or Assigns or some one of them shall and will well and truly pay or cause to be paid to the said Mathias Baker his Heirs or Assigns the said Ground Rents or Sum of Seven Shillings and six Pence Currency of Penna yearly at the days and Times herein mentioned for each & every of the said Lots of Ground According to the true Intent and meaning of these Presents. And the said Mathias Baker doth for himself his Heirs and Assigns Covenant and Grant to and with the said George Myrise his Heirs and Assigns that upon Condition of the Payment of the Yearly Ground Rents According to the true Intent of these Presents, State that the said George Myrise his Heirs and Assigns shall and from henceforth may have hold Occupy Possess and Enjoy the hereby granted two Lots of Ground and Promise as his or their Estate and Property without the Lawfull Lott Hindrance Interruption Molestation or denial of him the said Mathias Baker his Heirs or Assigns or any person By from or under him them or any of them. And further that he or they shall and will at the lawfull Request and cost of the said George Myrise his Heirs or Assigns Sign Seal and Execute any other Deed or Instrument of writing for the better conveying and afouring [?] the said Lots of Ground & Promises unto the said George Myrise his Heirs and Assigns as shall be council learned in the Law be Judged Necessary or Requisite. In witness whereof the said Parties hath hereunto set their Hands Seals the Day and Year first above written.